There’s been a noticeable absence of the Flash in recent episodes of The Flash, but “Goldfaced” takes that to a whole new level. Barry doesn’t make an appearance in costume until the last minute of the episode, and for most of the hour he doesn’t have his powers at all. That goes for Ralph as well, and the other meta-members of Team Flash are likewise sidelined, with Cisco entirely absent yet again. The minimalism of “Goldfaced” suggests a show that has gone over-budget elsewhere and needs to make up the cost overruns, but it mostly works as an effective change of pace. We begin with the plan to use the meta cure against Cicada, which is evidently not as controversial as I’d assumed it would be. Wasn’t one of Caitlin’s conditions for working on a cure the understanding that it wouldn’t be used on anyone against their will? If she’s willing to make an exception in the case of Cicada, where is she drawing the line—and what’s to prevent it from shifting in the future as circumstances dictate? There’s not even a discussion about this; she’s simply going along with Barry’s idea from the start, as is the rest of the team (with the possible exception of the absent Cisco). In any case, administering the cure to Cicada will require him to sit still for a full minute, which in turn requires the acquisition of a piece of black market tech called the Neuro-Stasis Field Generator. With Amunet in the wind, Central City’s black market is now being run by Goldface, so Barry and Ralph go undercover to buy the device. The black market turns out to be a sort of Sharper Image for the criminal weapons trade, and business is booming. Ralph and Barry are slapped into power-dampening cuffs as a precaution, thus setting up a scenario where they are forced to deal with the bad guys without their usual bag of tricks. 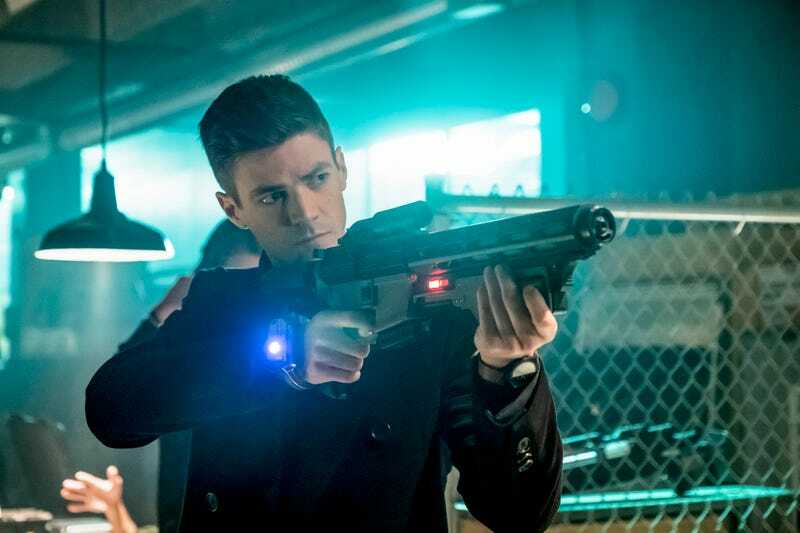 The result is a harder variety of action than we usually get from The Flash—more in line with Arrow, as is the darker visual palette. A shootout scored to Rob Zombie’s “Dragula” is definitely off-brand for this show, and even the bad guys are quick to pick up on the fact that Barry is out of his element. Scum recognizes scum, as Goldface would have it, and Barry is too squeaky clean to pass. Goldface and company fall a little too easily for Barry’s claim of being master criminal the Chemist, but Ralph isn’t so quick to buy that he’s willing to get the Flash’s hands dirty. The theft of an 3D organ-printing device bound for a hospital is a step too far, so Ralph makes sure Barry is left behind when the heist gets underway. “The ends justify the means” is the phrase that comes up several times in this episode. 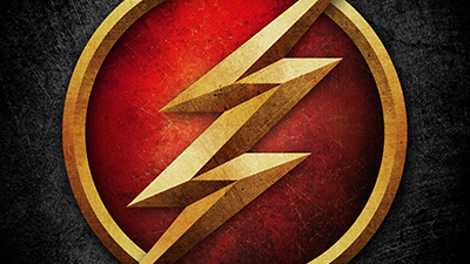 The question becomes whether Team Flash can take down Cicada without breaking the code of ethics that distinguishes them from the darker vigilante crowd. Iris tries to do her part in her role as Central City Citizen reporter (yes, she’s already launched her “newspaper” and it’s already getting bad reviews) by learning the location of one of Cicada’s hideouts from his old boss. There’s a bit of suspense as Iris finds herself trapped in the house with Dwyer and pretends to interview him about lead in the local water supply, but it’s undercut by Chris Klein’s growly try-hard performance. Nora is also practicing the “ends justify the means” philosophy by continuing to work with Thawne. She knows Sherloque is onto her, and Thawne evidently has multiversal knowledge about Wellses simply by wearing one of their faces, so he suggests distracting Sherloque with love. It turns out Sherloque’s ex-wives are all versions of the same woman from different Earths, which is kind of creepy in a way that suggests a sci-fi Vertigo. (I mean the Hitchcock movie, not the DC Comics line.) Earth-1 also has a variation on Renee Adler, so Nora arranges a meet-cute at Jitters that brings them together. Since Renee is a meta, Sherloque turns his attention back toward a plan to defeat Cicada. Every episode ends with a new one of those lately. This time, Iris has discovered Cicada’s weakness is his chest injury, which may be a way of incapacitating him long enough to administer the cure. Whether the characters will get around to debating the ethics of that move remains to be seen. “I knew all that Red Dead would pay off.” I think I identify with Ralph most of all. Renee Adler is a spin on Irene Adler, in keeping with the Sherlock Holmes theme. My friend Wikipedia tells me Irene only appeared in one of A. Conan Doyle’s Holmes stories—and not as a love interest, although she’s been portrayed that way many times since. The council of ex-wives was an amusing spin on the previous councils of Wells, but Sherloque really should pay his alimony. And not just because they’ll send Breacher after him otherwise. I did enjoy Sherloque using his deductive technique to determine that the man in Jitters was about to fart.